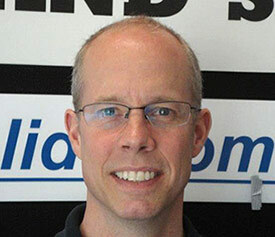 Bryan Funk is the new President of Fourslide Spring & Stamping, becoming just the third person to hold the position in the company’s 56 year history. He succeeds his father, Arthur Funk, Jr., who followed founder Arthur Funk, Sr.
Bryan joined the company in 2006, assuming responsibility for the assembly department. Having achieved tremendous gains in efficiency and productivity in that area, he was promoted to VP, General Manager in 2012. Bryan is a graduate of Rochester Institute of Technology. He and his wife, Laurie, live in Bristol with their three children: Ben (currently matriculating at RIT), Katie, and Danny. Bryan is an avid cyclist, both on and off road, and a highly skilled woodworker.